It's that time of year again. Halloween has barely passed and already Christmas is already making itself known. The red cups in Starbucks are back, Oxford Street is adorned in lights, and I don't know of anyone whose heart hasn't melted over the new John Lewis Christmas advert. Less than 50 days now people! Although it still seems a long way off yet, it's never too early to start thinking about advent calendars. Particularly those sought after beauty advent calendars that sell out in record time.You need to get in there quickly. How awesome is this design?! Why have a flat pack advent calendar when you can have a house?! The snow, the fairy lights and the foliage all scream Christmas. 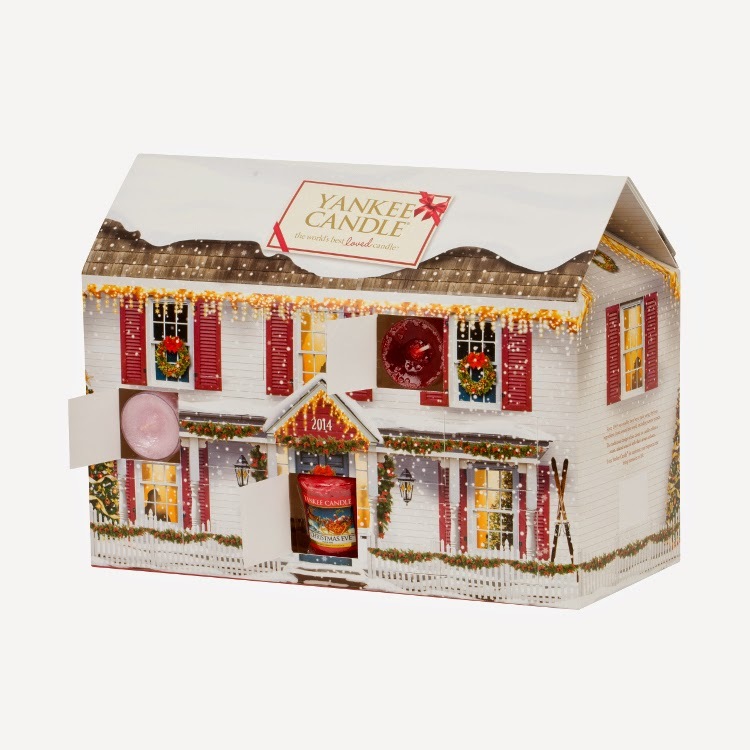 Candles in this one include; candy cane lane, Christmas garland, snowflake cookie, sugared apple, Christmas cookie, Christmas memories and spiced orange. A slightly cheaper option with the shape more in line with last year's wreath. However I can't help but prefer the colouring of last year's. Red is so warming and the ultimate Christmas colour. I'm not so sold on their choice of white this year. Although white makes me think of snow, here it just looks a bit plain. Candles in this include; icicles, angel's wings, snowflake cookie, cranberry ice, Christmas cookie and Christmas garland. Although I don't have one in my possession yet, I can already see an improvement on last year's. Their 2013 advent calendar didn't contain as many candles - there were only a select few on rotation, meaning you had a lot of 'repeats'. Which was great in some cases, but not so great for the sickly sweet scents which I'm not the biggest fan of. There does seem to be more varied choice this year including some new addtions which will be great to try. Are you feeling Christmassy yet?